Asbestos is a mineral made up of small fibres. In the past, it was used in building materials because of its strength and heat-resistance. 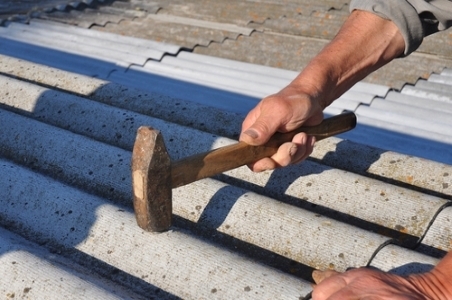 The most common place to find asbestos in New Zealand homes is in asbestos cement. It can also be in floor backing, textured ceilings, lagging around pipes, and insulation. Asbestos was used a lot in New Zealand until the 1980s. After that, the health risks became known and it was phased out. Houses built before 1984 are most at risk of containing asbestos. What are the harmful effects of asbestos? When someone breathes in asbestos dust, the small fibres get into the lungs. The effects of asbestos exposure can take as long as 40 years to show themselves. Even so, asbestos-related lung disease is rare. More often than not, small amounts of exposure to asbestos at work or in the home do not result in long-term harmful effects. asbestosis (scarring of the lungs). If you may have been exposed to asbestos in the past, report any lung symptoms like persistent cough, breathing problems and coughing up blood to your GP. If you have lung symptoms, they could be the result of exposure to asbestos up to 40 years ago. Your GP may ask you to have some tests. These could include a chest X-ray, a CT scan of your chest and spirometry. The risk of harm from exposure to asbestos around your house is very low. You are unlikely to need any further tests. Any asbestos exposure around your house following the Canterbury earthquakes and during earthquake repairs is unlikely to have caused any harm. See the Ministry of Health's Asbestos advice for householders for answers to questions about asbestos in Canterbury following the earthquakes. You should still take precautions to avoid breathing in asbestos fibres. You are most at risk if you have worked with asbestos in the past, for example, in the shipbuilding, construction, insulation, electrical, pipe fitting or demolition industries. The risk is greater if you have worked with asbestos over many years. Most workers in the construction industry who were potentially exposed to a higher level of asbestos in early earthquake repairs have been identified and reported to WorkSafe New Zealand. If you may have been exposed to asbestos through your job, you, your employer, or your GP will need to notify WorkSafe New Zealand. If your health needs to be monitored, this will be arranged through WorkSafe New Zealand. Usually your employer will pay for this. Your GP should also lodge an ACC Claim. This page has information about identifying asbestos-containing material in your home, the health risks of asbestos, and what you can do about asbestos. Information about diseases caused by asbestos, including pleural plaques, lung cancer, mesothelioma and asbestosis. ACC – Asbestos-related disease (http://www.acc.co.nz/PRD_EXT_CSMP/groups/external_providers/documents/guide/prd_ctrb113163.pdf) ACC Review. Issue 11 June 2014. Retrieved October 2016. HealthPathways – Asbestos exposure, retrieved January 2017. Ministry of Health – Asbestos, retrieved October 2016. Patient.info – Asbestos-related diseases, retrieved October 2016. Mayo Clinic - Asbestosis, retrieved October 2016.